Did you know that the flowers of Raphanus sativus come in several colors, including in my garden, purple, white, and pink? I did not know that until I went out to the vegetable garden yesterday to pick whatever was ready to pick before the big rains came. Oh, the big rains? There really hasn't been a big rain so far this weekend. There were a few scattered showers here and there, but they hardly left a drop in the rain gauge and we have so far gotten nowhere near the three, five, or six inches of rain we were supposed to get, depending on which weatherperson you listened to. I, like a fool, blew the opportunity to work in the garden yesterday because I thought it was going to rain "any second". Never again, I tell myself, once again. We may still get the rain today or tomorrow, but I won't be fooled twice. I will go out to the garden even under the threat of rain and garden until it is a full-fledged downpour. And yes, by garden I mostly mean weed. The vegetable garden cathedral is in its usual late summer state. There are plants no longer producing that I should pull out and the tomatoes are all flopping over, not yielding too many big tomatoes, but offering me hundreds of small cherry tomatoes. The weeds are gaining their foothold, or should I say roothold, and maturing to the point that they can cast a thousand seeds about the garden so that I am tormented by them next year, too. Amidst all of the mess and disarray are Raphanus sativus, radishes, that I never pulled. When I saw them flowering yesterday, that's when I realized that the flowers can be purple or white or pink. 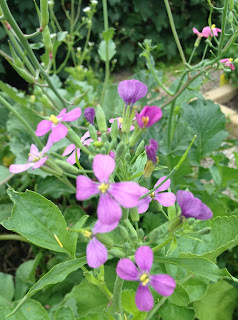 Pardon my manners, as I know it is especially uppity to talk about vegetable plants using botanical names instead of common names. But when talking about flowers, it just makes more sense, at least in the gardening circles in which I rotate, to use botanical names. It makes them sound more like official flowers rather than plain ol' radishes that I let go and allowed to flower and presumably set seed. I think the pink ones are my favorite.That little bit of white in the center is a nice touch. OK I fell for your bait, thinking there was some rare sighting because the name seemed so unusual. But no, you were pining over what for many is their first vegetable harvest. My Purple Topped turnip came before good old French Breakfast. The frenchies must have been very old. No wonder I don't eat or grow radishes. Never thought about that until. But what I wouldn't give to sow my own radishes now since for over 10 years I've been a quadriplegic. So thank you for your rare exotic that made me dwell on some of my first and favorite gardening thoughts. Carol, those blooms are so pretty I might have to sow some radishes and let them set seed. I'll bet pollinators love them too! 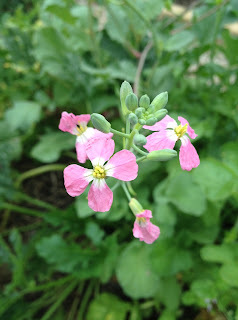 Ha, I've never even thought about blooming radishes, since I've never grown them, but those are quite fetching flowers! Bloomin' radishes, indeed! I wonder if you can eat radish flowers in a salad? They's be a pretty, perhaps peppery addition. I just learned that radish leaves are edible -- and here was I, turfing them into the compost all my life. Anyway, by now I would imagine that predicted rain finally fell, but I understand your frustration. I passed up the first Illini football game yesterday, thinking we would be caught in a deluge. Instead, it just sprinkled, and the sun even came out in the second half--while I watched on TV:( But the rains did come later--we had 4 inches yesterday! I did the exact same thing this weekend. Went in early because I was sure it was about to rain, but there was hardly a drop. I actually did some watering yesterday. 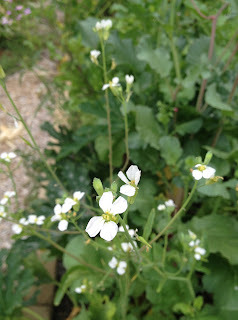 Nice radishes flowers - maybe you could start promoting ornamental radishes. Only weatherforecasters get to be soooo wrong and still keep their jobs. LOL Here in se Indiana, we got 7 minutes of rain on Sat. It rained longer on Sunday, but was more of a misty rain, so I'm not sure how much total. I plan to hike to our wetlands part of our wood/creek and see what's blooming now. Last week I found Great Blue lobelia even without any recent rains. Your bloomin' radishes are very lovely! I totally understand delaying activities because of the forecast of rain. I delayed garden work and going to the beach last weekend because of the chance of rain and just ended up sitting in the house miserable. I also use botanical names along with the common names in my blog, thanks for sharing! I have grown radishes. My husband loves them,not so uch me, but I have never let them flower. Lovely flowers! There you go again. Pointing out a beauty that I overlooked. Thanks.